MacDonald Highlands’ pride and joy is DragonRidge Country Club. This secluded 18 hole course with its fairways, greens and tee boxes was sculpted and carved by famed designers Jay Moorish and David Druzisky who placed the golf course back into the canyons, among the rock outcroppings and arroyos, utilizing dramatic elevations changes throughout. The DragonRidge Country Club features 35,000 square foot stone and glass building features a gourmet dining room viewing the Las Vegas Strip, two mixed grills and lounges, a fitness center, a swimming pool, a children’s pool and an extensive golf pro-shop. Private golf membership is limited, giving members and their guests a choice of tee times for frequent and leisurely play. A complimentary social membership to the country club is provided to lot owners upon application approval. MacDonald Highlands has neighborhoods under development with custom lots that provide a variety of choices for buyers. Each neighborhood features its own distinct topography and views. 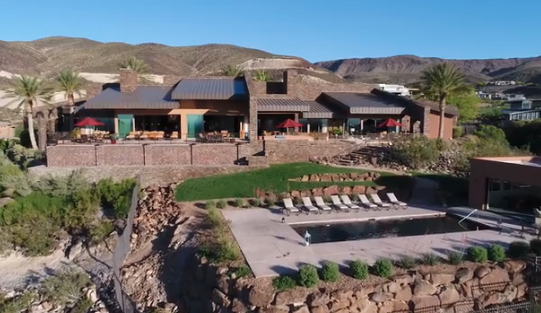 Buyers can choose from a variety of terrains including flat golf frontage, multi-level pads or hillside elevations with views of the golf course, mountain range, or panoramic views of the Las Vegas skyline. These custom lots range in size from 1/2 acre to 2 1/2 acres. Prices start at $800,000 to $3.5 million. Located just minutes from the Las Vegas Strip and McCarran International Airport, the lushly landscaped entry at the intersection of Valle Verde and Horizon Ridge welcomes guests and owners to MacDonald Highlands. For more information on this luxury real estate in Henderson, Nevada, visit our website or contact Kristen Routh-Silberman at 702-467-7100.